What I'm about to suggest may seem completely insane, but bare with me for a moment. If you're reading this and you happen to be a devoted sci-fi geek, such as myself, and it's your turn to pick a film in the cinema for you and your girlfriend (or boyfriend) - who happens to not be a devoted sci-fi geek - then Gareth Edwards' début movie might be the, date night, feature for you. 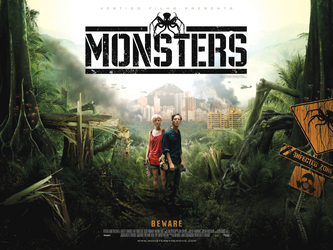 Monsters tells the story of photojournalist, Andrew Kaulder (Scoot McNairy), as he reluctantly escorts his boss' daughter (Whitney Able) through Mexico back to the United States. The only catch seems to be that half of Mexico is now overrun by some giant extra-terrestrial squid-like creatures, making life rather horrific for the locals. So far so Jurassic Park meets Cloverfield. What sets Monsters apart from the strewed brand of, soulless, sci-fi survival horrors I suffer through on a yearly basis (Skyline is unfortunately still fresh in my mind) was that it wasn't really a survival horror at all - despite trailers and posters suggesting otherwise. Though tensions are high and there's always an intense edginess that something terrifying is just around the corner, the film is surprisingly a rather touching and intimate love story between two lost souls - like Lost in Translation, except replace Japan with an alien infested Mexico. This combination of profound loveliness mixed with unsettling imagery could've easily been a recipe for disaster - especially with the sparse scattering of appearances from the alien menace in the film - if it were not for the two brilliant leading performances. Whitney Able and Scoot McNairy's chemistry was so seamless on screen it comes to no surprise to find out, after the curtain raises, the two are actually married in real life. Their characters were both multi-layered, likeable souls from the film's opening moments right through to its ambiguous end. Similar to last year's excellent District 9, Monsters' social observations were as subtle as they were highly provocative. I found it fascinating to see instead of run in horror and despair, that the locals of Mexico simply tried to just 'get on with it', adapting to life with the aliens - albeit with mixed results - instead of America's rather potent and ironic answer which is to just build a huge wall to keep the ghastly beasts out, including any potential refugees. If any happen to approach the American boarder, well, you just blow them up. Simple and effective, if not the most humane of plans I have to admit. Monsters most impressive feat however was that Gareth Edwards shot the entire production - filled with grand cinematography and impressive visual effects (he processed entirely in his bedroom on a Mac using store bought, Adobe Autodesk 3DS Max) - on a shoestring budget of $500,000. This isn't to say the special effects were quite as good as a film with a few million extra latched onto it but the film never once felt cheap or rushed, holding my attention through its entire running time. The production was also carried beautifully by a moody ambient score by electronic artist, Jon Hopkins. Despite the hype Monsters, regrettably, isn't quite "the next District 9, Jurassic Park or Cloverfield". It is however a superbly acted and deeply mature love story, set against a sparse, epic and ruthless backdrop of extra-terrestrial wilderness. If Gareth Edwards can achieve something like Monsters on a minimal budget, it excites me to see what the future holds for yet another shining light in a, seemingly, growing list of high quality British film-makers. Monsters is in cinemas throughout the UK now. Belfast audiences can see it in the wonderful Queen's Film Theatre from Friday December 10th 2010. As a big fan of D-9, I'm definitely intrigued by people's comments that this one has the same vibe. Interesting that the best sci-fis were made on a shoestring budget (D-9 was made on the cheap as well I believe). I also like 28 Days Later so if this is D-9 meets that Boyle movie, I think I'll like this one. It's not quite as gung-ho with the action as District 9 was, but a brilliant story all round nevertheless. Just like Ruth, I'm intrigued. I love District 9 which I consider as the best movie in 2009. Tho you said it's not quite like D-9 but it seems pretty impressive since you give it 4 stars.